The APL believes that spay and neuter is the key to reducing the euthanasia of companion animals. Thousands of cats and dogs are put down by our local animal control contractor each year. We work to stop this tragedy with proactive solutions to reduce the number of unwanted cats and dogs. Donations are vital to our mission and help save lives! » 99% of every dollar donated goes strictly for veterinarian bills. Please consider making a tax-deductible donation to the APL to help us meet mission goals. Thank you! Donations help pay for sterilization, vaccinations, microchips and other care as needed. Please call or stop by a clinic to donate directly towards the APL account. 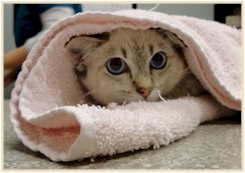 Your tax-deductible donation will assist our Spay, Neuter and Vaccination program. Please consider a recurring donation. We appreciate donations in memory of a beloved person or pet. If you or someone you know would like to give a Memorial Donation, in lieu of flowers, please ensure that our address is listed as APL, PO Box 51, Fort Walton Beach FL 32549. If you would like to donate pet supplies (ie, cat or dog food, cat litter, disposable puppy pads, etc) please call 850.830-2909 or send an email. DOES NOT IMPLY ENDORSEMENT, APPROVAL OR RECOMMENDATION BY THE STATE.